I have been fishing for many years and enjoy fishing for trout in the rivers and Lochs around Scotland. I especially enjoy fishing for wild Atlantic Salmon on some of the larger Rivers in Scotland such as the Tay, Tweed and Spey. I offer Casting instruction for both single and double handed rods. Techniques include: Double hauling, Roll casts and casting into the wind. 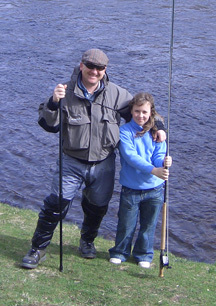 I also specialise in teaching speycasting to beginners.